Kawhi Leonard is now a Toronto Raptor, and he is ready to push Masai Ujiri’s squad to new heights. Head Coach Nick Nurse is replacing Dwane Casey after serving for five seasons as his assistant. By replacing DeMar DeRozan with Leonard, the Raptors could make their first NBA Finals in franchise history. 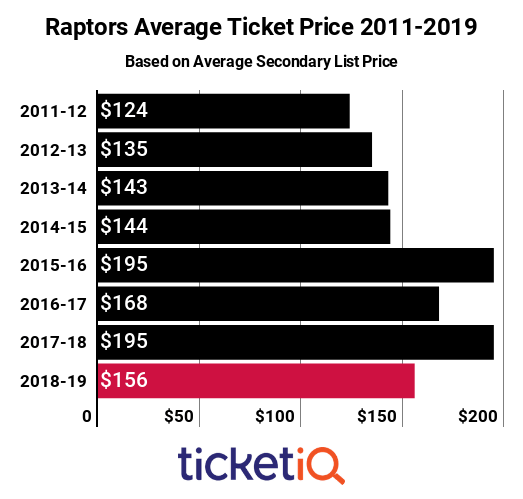 However, Toronto Raptors tickets on TicketIQ.com are their cheapest since 2014-15. Toronto’s average ticket ranks as the 19th-most expensive in the league this season at $156. The rank is the lowest since 2011-12 (when TicketIQ started collecting the data). With the likes of Kyle Lowry, Serge Ibaka, Jonas Valanciunas, OG Anunoby, C.J. Miles and Fred VanVleet returning, the Raptors have a strong base to build upon. They are coming off a sweep at the hands of the Cleveland Cavaliers. Although LeBron James is out west, the young guns in Boston and Philadelphia will be battling the Raptors in the Eastern Conference this season. Leonard brings championship experience to a team that is looking for its sixth consecutive playoff appearance. The 2011 first-round pick owns some impressive hardware: the 2014 Finals MVP award along with being a two-time All-NBA First Teamer and two-time Defensive Player of the Year. He hopes to give the Raptors the boost that they have been looking for since their Eastern Conference Finals appearance in 2016. The Raptors’ highest-priced home games of the season mostly come in February and March, but their matchup against the defending champion Golden State Warriors on November 29 is the third-highest Scotiabank Arena basketball contest this season at an average ticket price of $285 and get-in price of $115. The next popular game on Toronto’s home schedule comes when Leonard and company host his former squad. DeRozan, LaMarcus Aldridge and Gregg Popovich travel above the border to take on the Raptors, and the get-in price is $142.80. 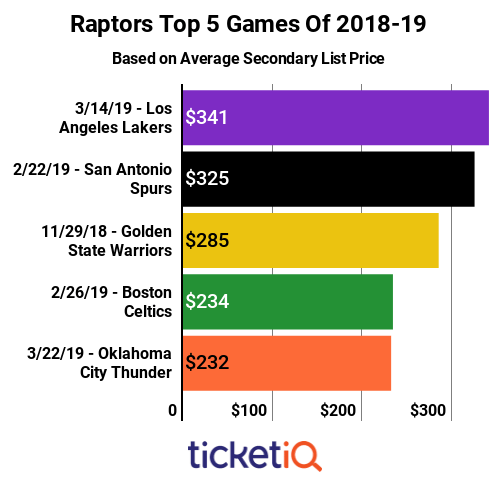 The average price is the second-highest among all home Raptors games at $325. Just four days after the Raptors tip off with the Spurs, the Atlantic Division foe Celtics come to town. Just like Toronto, Boston fell to Cleveland in the 2018 playoffs. Brad Stevens, Kyrie Irving and Gordon Hayward take on the Raptors in their final regular season meeting on February 26, and the average ticket price is $234, the fourth-highest price of any Raptors 2018-19 home game. The get-in price is just $82 to see these two Eastern Conference superpowers. Then, in March, LeBron James heads to Toronto for his only trip of the season. His Lakers are at Scotiabank Arena on March 14 for the highest-priced Raptors home game of the season. This important regular season game is a must-see, as the Raptors attempt to end their losing streak to LeBron. In the past, Leonard has had success in stopping him, but he will have to be back to full strength in order to do so. The Raptors are ready to start anew with a new star player and a new coach, but the upcoming season will not be an easy one. Toronto will have to battle Boston and Philadelphia in the Atlantic Division, and if the Raptors get to their franchise’s first NBA Finals, they will have to take on the Warriors or another difficult Western Conference champion. With Leonard now in Toronto, the sky could be the limit though.